On the sunny Thursday afternoon of 18 May 2017, Chia Meng Yee (GHR Dept), June Moh (GHR) and David Chia (IT) set off to visit Persatuan Kebajikan Hak Untuk Belajar (Right To Learn) Kuala Lumpur (“RTL”) in Taman Tun Dr Ismail, where Amcorp Properties Berhad (Amprop) donated several units of pre-owned computer notebooks and office furniture, including tables, chairs and cabinets. 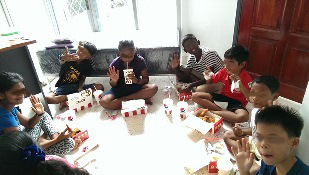 For the visit, we also brought along 50 packs of KFC meals to be given to the children and volunteer teachers. Group photo, Right to Learn’s children and teachers with Amprop’s officials. 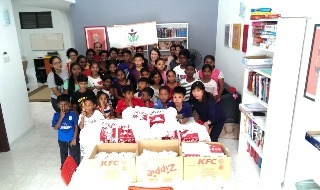 Located along Lorong Burhanuddin Helmi 6 in TTDI, RTL is a charitable non-profit learning centre which provides education support to help eradicate illiteracy for children, from disadvantaged and challenged backgrounds. These children are between 7 to 17 years old. Founded by Ms Yans Ganghadaran in 2007, RTL’s mission to provide accessibility to all children to learn is done via their Literacy Programme, Skype Volunteering, to give school work support as well as parental support. RTL’s Literacy Programme offers free reading and writing lessons for the English Language and Bahasa Malaysia. Apart from this, RTL also offers tuition for the Mathematics and Science subjects to the children. These lessons are conducted by volunteers ranging from trained teachers, university student, home makers and even school-going children who want to give back to society. The Programme arranges everything from pick up to drop off service, tutoring and even provide the learning materials such as books and exercise workbooks to all the children, free-of-charge. Skype Volunteering is a cross-border reading programme where volunteers teach children to read via Skype. Volunteers from both within and outside Malaysia can conduct their online teaching sessions anytime at theirs and the children’s availability. Online learning has been rewarding for both the tutor and the child as progress is evident in the children’s reading abilities. School work and parental support has proven to be effective in helping these kids who are lagging behind their peers in school and cannot afford to pay for extra tutoring. Tutors provide guidance and technological support to complete assignments, especially in the area of Information Technology where these children cannot afford a computer at home. Since 2007, RTL has helped more than 300 children and envisions to transform 10,000 illiterate children into readers, to help them achieve their dreams. Apart from the existing programmes, RTL is also looking to extend to computer and life skills lessons for these children in the future.